Live comfortably and allergy-free in our wonderful newly built vacation chalet (40m2) in the Stockholm Skerries. 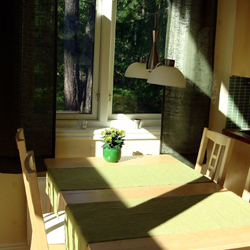 From the house you can smell the warm pinetree forest, admire the peace and calm whilst admiring the scenery. The chalet has sea view and is only 10 minutes walking from a sandy beach. The chalet comfortably sleeps four people in two separate bedrooms (loft with two single beds + one bedroom with a bed which is 160cm wide), with the possibility to sleep a total of six people (with extra matresses on the floor). You can check availability and book online! Looking down from the loft you see the living room area with a sofa, two seats and the kitchen table. You can also see part of the kitchen from the loft. The loft offers a beautiful sea view. 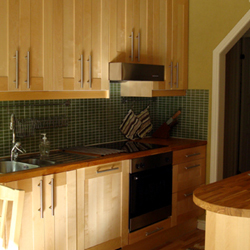 The chalet has a fully equipped kitchen with microwave, dishwasher, oven, fridge, freezer, cutlery etc. The kitchen table is big and can easily be extended. We have a fast internet connection (broadband) available for those who like to bring a laptop. The bathroom (with a WC) offers warmwater shower, towel heater and heated floors. The chalet has a nice fire place which is really nice during the early spring, fall and wintertime, when you want to relax with a good book and a cup of tea. The chalet is well isolated so that you can enjoy it any time of the year. We have simple fishing gear and life vests for grown ups and children (not for children under 8 years) which you can borrow, as well as a mooring for a boat which may not be deeper than 2m. You can also rent our open motorboat with an outboard engine. We also rent out boats, baby beds, high chairs, bicycles (and child seats), use of our washing machine and dryer, jacuzzi, kayaks. Please see our booking form regarding the kayak, boat and the bicycle prices (kajak = kayak & cykel = bicycle & båt = boat). Please also read our rental conditions.